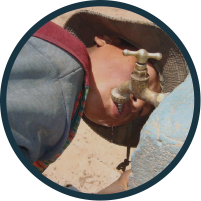 In 1993 the Tulsa Southside Rotary Club drilled the second potable water well in the entire Altiplano (High Plain) area of Bolivia. 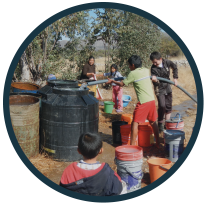 In 1999, an elder of the village said that before the well was drilled, 20-30 children died each year. Since 1993, the death rate has dropped to only 2-3 children each year. The elder believes that the total credit belongs to the well. In fact, he said that clean water has meant more to the health of the village and saved more lives then any doctor ever could. After 15 years of faithful service, the Konani Water well is not producing as much water as it used to. Engineers-in-Action is giving the old well some well-deserved TLC. We are organizing the community to clean and reseal the water tank. Adding new valves, switches and controls. And we are testing to see if we need to re-drill the well or replace the pipe which is ‘down the hole’. Without the work of EIA, this well would become inoperable and abandoned. In December of 2008 we built a facility to house valves and have cleaned the tank. We are currently testing the well to see what we need to do to increase the amount of potable water it provides.